Here at last! An inflatable wetsuit that has inflation chambers located in the front and back! Hero have Patents Pending on the Worlds first fully functional Inflatable Wetsuit! interfere when lying on or paddling your board. Hero Inflatable wetsuits are designed to roll the wearer onto their back once activated, this is a must have feature especially if you have blacked because you have held your breath for too long. Once inflated your head is supported by the rear of the inflation chamber and the chest area inflation ensures your face remains out of the water. In the event of you damaging your inflatable wetsuit, wearing it out or just tired of the same look, your wetsuit can be repalced without having to buy a completely new setup. Simply contact the retailer you purchased your suit from get another suit and the original bladder can be swapped over. All HERO Inflatable wetsuits come fitted with manual inflators and have a manual inflation tube as a failsafe backup. With the Hero Inflatable Wetsuit the user is able to manually inflate the suit through the backup tube to give added buoyancy. If the inflation is activated the suit will inflate in less than a second. Recharging of the suit is possible without removing it, simply release the air from the bladder, unscrew the used CO2 cartridge and screw the replacement cartridge in firmly. Make sure you replace the green clip that holds the lanyard in place. 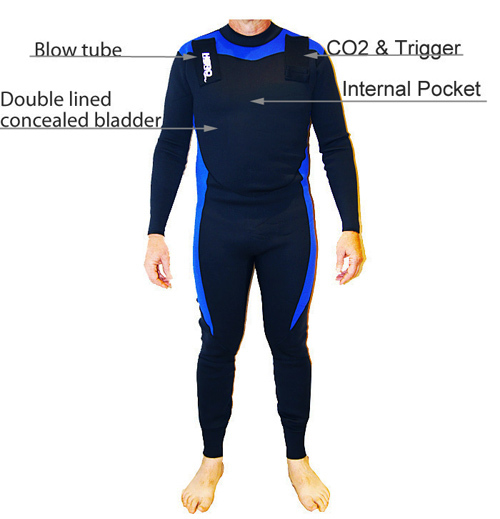 The entire process can be completed in less than 2 minutes and as already stated there is no need to take the wetsuit off. It is the responsibility of the wearer to make sure they comply with all applicable laws and standards when using our products.